What is really at the basis of the ongoing civilizational conflict between the US and China, a feud which many say has gradually devolved into a new cold war if few top politicians are willing to call it for what it is, are China’s ambitions to be a leader in next-generation technology, such as artificial intelligence, which rest on whether or not it can design and manufacture cutting-edge chips, and is why Xi has pledged at least $150 billion to build up the sector. But, as the FT notes, China’s plan has alarmed the US, and chips, or semiconductors, have become the central battlefield in the trade war between the two countries. And it is a battle in which China has a very visible Achilles heel. Even with the so-called truce between the two sides signed last weekend, and which promptly unraveled after the Huawei CFO's arrest was unveiled last week, Washington plans to ramp up export controls next year on so-called foundational technologies — those that can enable development in a broad range of sectors — and the equipment for manufacturing chips is one of the key target areas under discussion. This is a concern for China as the $412 billion global semiconductor industry rests on the shoulders of just six equipment companies, with three of them based in the US. Together, these companies make nearly all of the crucial hardware and software tools needed to manufacture chips, meaning an American export ban would choke off China’s access to the basic tools needed to make their latest chip designs. "You cannot build a semiconductor facility without using the big major equipment companies, none of which are Chinese,” said Brett Simpson, the founder of Arete Research, an equity research group. "If you fight a war with no guns you’re going to lose. And they don’t have the guns." To observe China's reliance on foreign products, look no further than the over $300 billion in semiconductor equipment China has imported over just the past 12 months. To be sure, under Beijing’s auspices, Chinese chip companies have made enormous gains in semiconductor design as well as chip testing and packaging, in an attempt to catch up to the US. Several private and state-owned Chinese companies — Intel-backed Tsinghua Unigroup, Cambricon Technologies and Huawei’s HiSilicon among them — have already begun to venture into designing the leading edge chips capable of AI applications. But, as the FT, notes, the real difficulty is not in designing the chips, but in making them: "From a design perspective, Chinese companies are at least on par with anyone else in the world,” said Risto Puhakka, president of VSLI Research. “Where they have a challenge is if they decide to make a very cutting-edge chip." The country's recent scramble, amid the push for China 2025 strategic plan, to become technologically self-sufficient in chip production is clearly visible in the next chart, showing the big spike in recent imports of equipment for semiconductor manufacturing. Still, as Chinese semiconductor plants try to catch up, they have few choices when outfitting or upgrading their chip foundries. The reason: only a few equipment suppliers remain after a decade of consolidation. Foremost among them is the Netherland’s ASML, which makes the photolithography machines that print and etch designs on to silicon wafers. It is the only supplier of the extreme ultra violet (EUV) lithography machines needed to make a 7-nanometre processor, the industry’s current gold standard. Over in the US, Lam Research and Applied Materials as well as Japanese company Tokyo Electron dominate the market for equipment that can deposit billions of transistors and other active components on to a single chip. Another US company, KLA Tencor, sells much of the technology used in testing and monitoring the quality of chip production. It is China’s reliance on these companies, more than any down swing in the stock market, that has made it vulnerable. What would happen if the trade war escalates to prevent China from catching up with the US technologically? Under current laws, an export ban on semiconductor equipment would mean both foreign companies, such as Samsung and Intel with foundries located in China, as well as wholly owned Chinese foundries would be unable to buy American equipment, though foreign companies are likely to be able to apply for waivers. “One of the ideas of export controls is to prevent the release of the tech to certain foreign nationals from China: as an example, that could mean to a Chinese national wherever they are located, or to anyone within the physical geographic region of China,” said Anthony Capobianco, a partner at Hogan Lovells in Washington DC. A US ban would also impact non-American chip equipment suppliers, because of the integration of what is a highly specialised supply chain: “ASML cannot do without Applied Materials and the other way around. If you take even one out of the value chain, that may hamper Chinese fabs,” said a former ASML executive. Puhakka of VSLI Research said: “[These equipment suppliers] have the research and development, the trade secrets in metallurgy, the recipes: all of that knowledge base is 40 years old.” said VSLI Research’s Mr Puhakka. "This is not about money. This about the knowledge base . . . and that knowledge base is not moving" he added, delineating China's core dilemma. Still, slowly China is catching up and some mainland companies are starting to produce their own chip-making equipment. At the head of the pack are Shanghai-based AMEC, which makes both wafer fabrication and packaging equipment for 28nm chips, Shanghai Micro Electronics Equipment, which is creating chip-etching lithography machines, and CETC, the state defence company, which announced a 28nm ion implanting device this August. But what matters in the global technological arms race is that no Chinese company is close to being able to offer equipment that can produce the current target size of 7nm chips. SMEE’s machines can only match what ASML was able to do about 15 years ago. Today’s most basic smartphones require chips that are between 14nm and 16nm in size, but the smallest chips offered by China’s biggest manufacturer, SMIC, is 28nm. And if the US cuts them off from purchasing foreign equipment, Chinese plants will also miss out on accumulating operational experience. “Basically, it’s a double whammy,” said Mr Simpson from Arete Research. “You’ve got two big bottlenecks. You need to get the equipment into your fabs [plants] and secondly, you’ve got to know how it runs and the intellectual property process to make use of that equipment,” he explained. Of course, being behind doesn't mean China would give up, and if faced with US export controls, Chinese-owned plants could simply continue producing lower-end semiconductors, such as analogue chips, used in everything from industrial robots to electric vehicles. However, out of reach in the medium term would be making the most advanced chips able to support AI functions or 5G telecommunication networks. Leading edge chips are also where sales and margins are highest. TSMC expects revenue from sales of advanced chips 28nm and smaller to rise to as much as 70% by this year, up from 42% only four years ago. The risk is that an overly aggressive posture would backfire, and force China to become entirely self sufficient, because in the long term, analysts said, a US export ban would likely cement Beijing’s resolve to cultivate a wholly home grown semiconductor industry along every step, from design to fabrication to packaging. “In the short term, US export controls can seriously set back Chinese progress on semiconductors. In the longer term, it’s hard to say if China will be permanently set back,” said Gavekal’s Wang, noting that fear of US export controls helped marshal the resources that shaped Japan’s most dominant semiconductor equipment players. ... in the technological arms race. 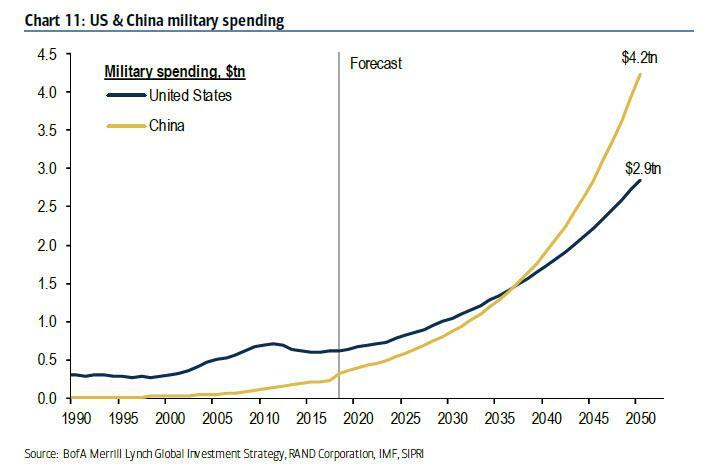 Because remember what Bank of America's Michael Hartnett said half a year ago: for all the talk of the escalating confrontation between the US and China, the "trade war" of 2018 should be recognized for what it really is: "the first stage of a new arms race between the US & China to reach national superiority in technology over the longer-term via Quantum Computing, Artificial Intelligence, Hypersonic Warplanes, Electronic Vehicles, Robotics, and Cyber-Security." Which is why, at this point delaying Beijing may be the best option for the US which is slowly but surely losing its one insurmountable technological advantage. But while that may win the short-term battle, will it merely lead to an even faster victory for China in the war, first trade and eventually, real.